An Air China plane takes off from Munich Airport. Photo by Julian Herzog, Wikipedia Commons. 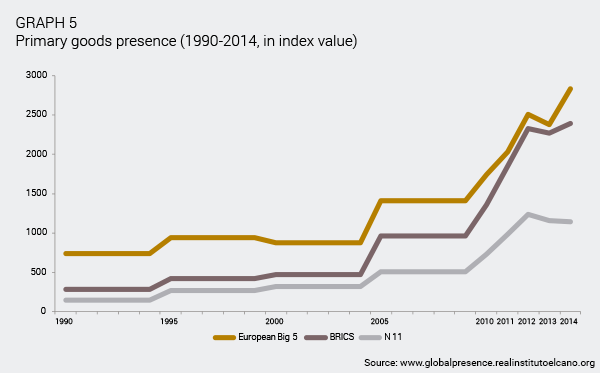 Our data show that the European Big Five (EB5) economies have lost considerable ground in their share of world economic presence, especially vis-à-vis the BRICS, although not so much against the N11. 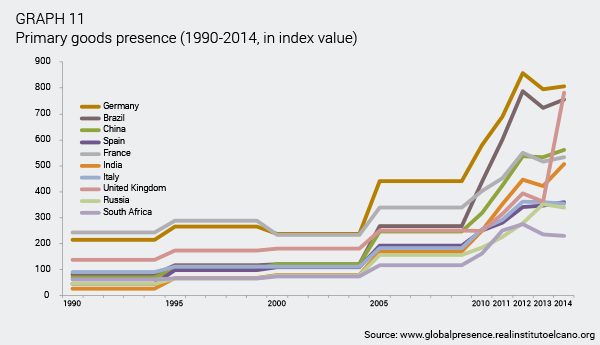 However, within the BRICS, the big out-performer (and hence outlier) is China. Differences also exist within the EB5. Here the big champion is without a doubt Germany. 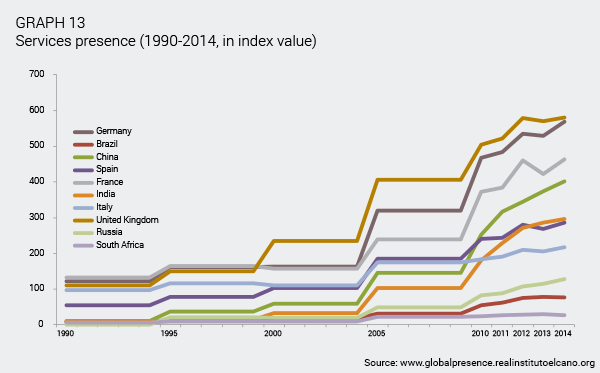 In this regard, the analysis presented here shows that over the past 25 years, the two champions of global economic presence are Germany and China. 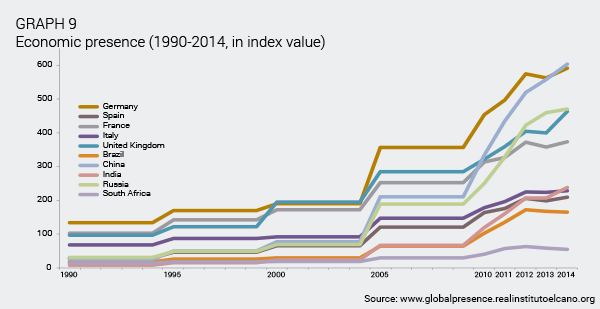 The UK has also shown considerable dynamism over recent years. France, despite being generally described as stagnant, has not done too badly – certainly better than Italy and Spain, which have recently been overtaken by India. In the aftermath of the global financial and economic crisis (2007-09), and the subsequent European debt crisis (2009-ongoing), many scholars and pundits have claimed that Europe is inexorably in decline, and that economic and, consequently, political power is shifting from the West, especially from Europe, to the East, primarily to China.1 Others, however, have contested this analysis, pointing to the fact that Europe is still one of the most wealthy trading and investment blocs, and hence arguing that its apparent decline is overstated.2 In this ARI I will try to provide some empirical evidence to that debate. The data show that the EB5 economies have lost considerable ground in their share of world economic presence. Nonetheless, when we desegregate the data, we discover a number of peculiarities. The BRICS have closed the gap with the EB5 much more than the N11 have done, making the BRICS more interesting to analyse. Furthermore, within the BRICS, the out-performer (and hence outlier) is China; thus it could be argued that the rise of the rest might be better described as the rise of China. Interestingly, in recent years India has also performed well, and it could potentially become the new star of the BRICS. Russia, by contrast, has reached a plateau and might even reverse its gains. Differences also exist within the EB5. Here the out-performer is without a doubt Germany. 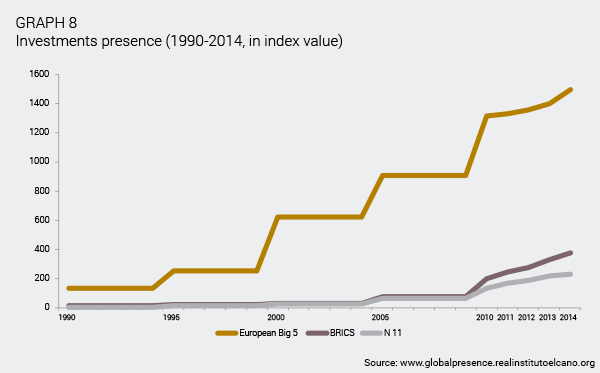 In this regard, the analysis presented here shows that over the past 25 years, the two champions of global economic presence within the EB5 and the BRICS are Germany and China, respectively. The complementarities of their economies have certainly helped to enhance their performance, which explains why their political leaders have recently invested so much political capital in strengthening their bilateral relationship.4 China and Germany feed each other in economic presence. Within the EB5, the UK has also shown considerable dynamism over recent years, and it is (after Germany) the 2nd best performer in the group. Despite being generally described as stagnant, France has not done too badly – certainly better than Italy and Spain, which have recently been overtaken by India. 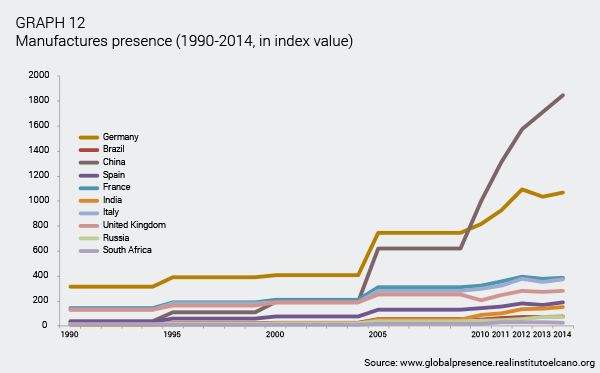 Within the BRICS, the laggards are Brazil and South Africa, and especially the latter, which has barely increased its global economic presence over the past quarter of a century. When observing Graphs 1 and 2, one can see that the EB5 have lost ground both in general global presence and, specifically, in global economic presence. Not surprisingly, this loss of share has been more pronounced in the economic field, where both the BRICS and the N11 are strongest, since roughly 60% of their global presence relies on this indicator (see Graph 3 on the contribution of economic presence in overall presence). 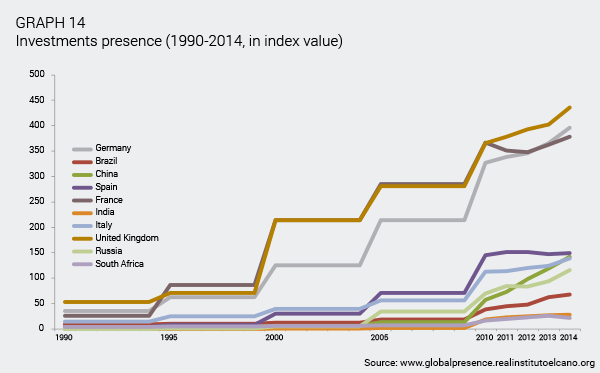 While in 1990 the share of general global presence of the EB5 was 24.2%, by 2014 it had decreased to 20.8%. This drop was even starker in economic presence, with the share falling 9 points from 26.9 to 17.9%. Graph 2 also shows that the BRICS have over the past few years caught up much more forcefully with the EB5 than has the N11. 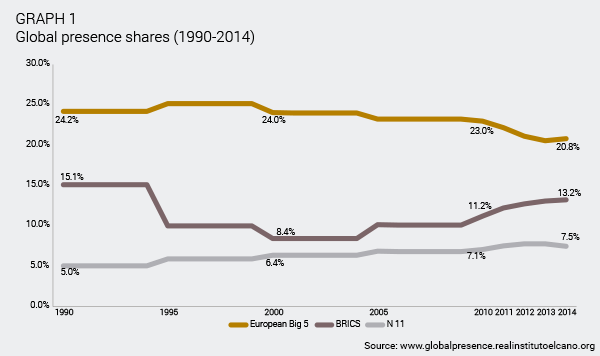 While the BRICS went from a share of 6.1% in 1990 to 14.7% in 2014, the N11 increased only from 6.6% (a higher share than the BRICS at that time) to 8%. This may explain why since the term was coined, the concept of the N11 has drawn much less attention than that of the BRICS. Table 1, which shows changes in position within the economic presence ranking, helps us to understand this circumstance. Here one can see how, of the N11 countries, only South Korea and Turkey have moved up the ranks, with the former doing considerably better than anyone else in the grouping. This comes as no surprise. Over the past 25 years, South Korea has moved from a low-middle income to a high income country, with a highly competitive and globalised economy.5 By contrast, countries such as Iran, Egypt, Pakistan and even the Philippines have disappointed in this field. Finally, countries with large populations and therefore with enormous potential, such as Nigeria and Mexico, have merely maintained their positions (despite the former being a big energy exporter and the latter a manufacturing powerhouse). The EB5 economies have all lost positions, although some more than others. Germany and the UK have only lost one position each, showing that their economies are still resilient to the competition coming from the global south and east. Still, it must be highlighted that Germany is doing better than the UK; in 2000 the UK was the 2nd global economic actor, and now it is the 5th, while Germany has maintained its 3rd position.6 France, for its part, has not lost as much ground as one might expect (it has lost three positions), demonstrating that it remains economically powerful. Certainly more so than Spain or Italy, which have lost six and five positions, respectively. The data therefore show that the EB5 are in decline, but that the UK and Germany are holding their ground vis-à-vis the BRICS. More worrying is the performance of Italy and Spain, which need to undertake considerable reforms (reindustrialisation, further internationalisation, and more investment in education and high tech sectors) if they want to retain both their relatively high living standards and their global economic presence. To achieve this, they will need to resist the increasing competition coming from the best performers within the BRICS group, above all from China, which has climbed 15 positions since 1990 and is now the 2nd performer in terms of global economic presence after the US. Interestingly, despite its outstanding performance, China has climbed fewer positions than India, which has moved all the way from rank 39 to 1. This is significant because by focusing on China, we often forget India’s tremendous achievements. Since our data divide the global economic presence of the different countries and groupings into five sectors (energy, primary goods, manufactures, services and investments), the next step is to undertake analysis in those sectors in which the BRICS and the N11 gain more ground (see Graphs 4 to 8). Here the empirical evidence reinforces the general trend explained above. The N11 grouping has under-performed compared to the BRICS in all five economic indicators. So for now, the real competitors for the EB5 remain the countries that comprise the BRICS. Specifically, where the BRICS (and also the N11) do outperform the EB5 is in the field of energy. This is a structural factor that will be difficult to change in the short term, although the focus on renewable energy and shale gas might bring some changes in the long term. Energy is also a field that is highly volatile and dependent on the price of oil and gas. In this regard, the recent fall in the price of oil might reduce the global economic presence of the BRICS, especially considering that energy represents the highest single contribution (19%) to their total global presence. When it comes to primary goods and manufactures, the EB5 remains on top of the three groupings, holding its ground in primary goods while gradually losing the race in manufactures. 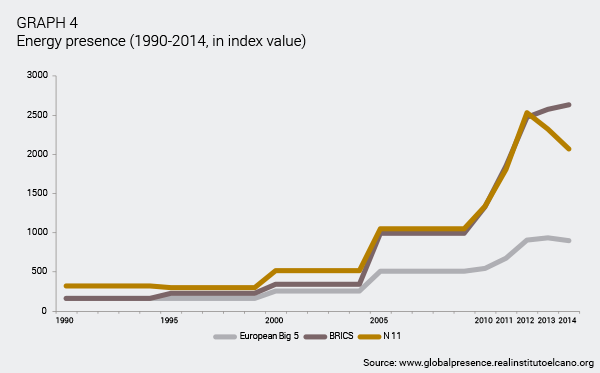 If the trend continues, it is very likely that in future years the BRICS will surpass the EB5 in manufacturing presence, despite all the rhetoric in Europe about reindustrialising the economy. Leaders in the UK, France, Italy and Spain have lately argued that one of their priorities is to revamp their manufacturing sectors, following the German example, but so far the effects have been minor. Where the EB5 countries remain strong is in services and foreign investment. In these fields, not only have they not lost ground against the BRICS and the N11, they have expanded it, especially in the area of investments. Given that these sectors are larger in monetary volume and more attractive as regards added-value, and therefore offer higher margins, the decline of the EB5 vis-à-vis the BRICS might be less than commonly assumed. 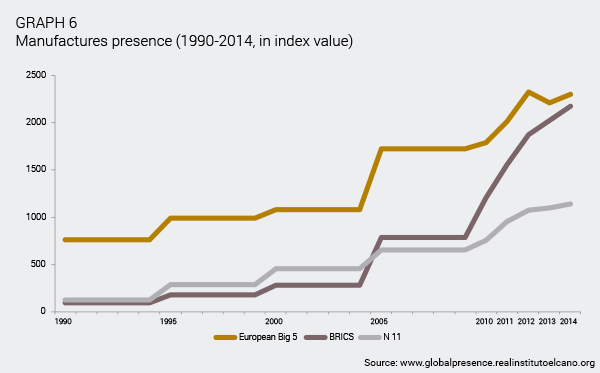 Europe remains a giant in services and investment. Of course, this does mean that a lot of European investment flows out of the continent, which explains why investment levels in Europe have dropped so much in recent times. However, looking just at the EB5 and the BRICS as groupings can be deceptive, because there might be considerable differences between the countries forming one or both of the groups, or even between countries across the two groups. To understand the trends in greater detail it is therefore necessary to analyse the performance of every single country – first overall in the global economic presence index, and then in each of the five economic sectors presented above. This is shown in Graphs 9 to 14 for the five countries that form the EB5 and the BRICS. The same could also be done for the N11, but due to space constraints such analysis will not be done in the present report. Graph 9 is perhaps the most illustrative because it shows how the two biggest world exporters are Germany and China; in other words, ‘Chermany’7 have out-performed everyone else. This is a joint success because they have each fed the other’s economies over the years. Germany is the European country that has invested most in China, thus helping it to develop rapidly. This has made China a manufacturing powerhouse (see Graph 12) on the basis of German engineering. 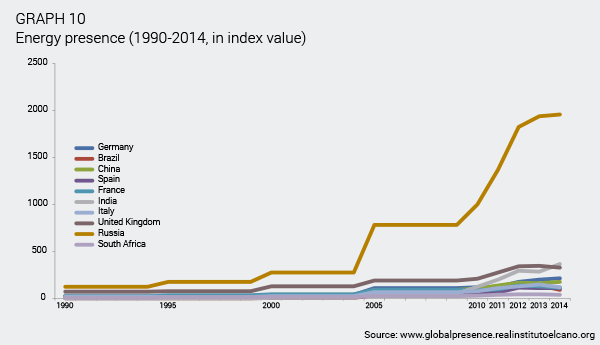 Especially during the global and European financial crises, Germany has benefited greatly from the growth of China. German machines are used not only for manufacturing, but are also essential to China’s real estate and infrastructure sectors. After China and Germany, the next countries with the greatest economic presence are Russia and the UK, followed by France. As can be seen in Graph 10, Russia draws most of its strength from the energy sector, which means that the recent fall in oil prices will hit that country twice in the coming years. Falling prices will reduce Russia’s global economic presence in energy as well as in other variables, such as investments. If one wants to see the positive side, the fall in oil and gas prices might conceivably force the Kremlin to diversify its economy, which could increase Russia´s manufacturing sector; but so far this is merely a hope, rather than a well planned-out strategy. The UK retains a lot of its presence thanks to services and investments (see Graphs 13 and 14), where it outperforms everyone else. The City of London, of course, remains an important asset with a tremendous global footprint. Where the UK has remained stagnant is in manufacturing – but so has everyone else, with the exception of the ‘Chermany’ tandem (see Graph 12). The UK experienced a notable jump in the export of primary goods from 2013 to 2014 (see Graph 11), but this appears to be mainly due to a one-off trend. Recently, a lot of gold stock has been shipped from the UK (especially from London) to Asia (particularly to India and China) via Switzerland, which has great refining capacity. In the primary goods sector, Brazil performs particularly well due to its agricultural products, but so does Germany, which exports far more primary goods than is normally assumed (especially copper and aluminium items such as tubes, but also processed food). These data also show in more detail the weaknesses of Italy and Spain, which in recent years have been overtaken not only by the first two BRICS (China and Russia) but also by a third, India (see Graph 8). 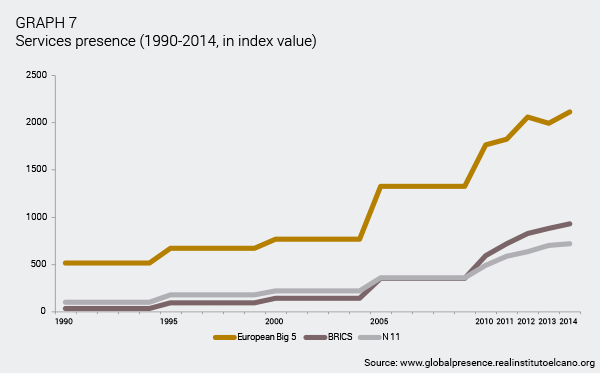 The rise of the other big Asian giant, with more than 1 billion people, can be explained by its minor advances in the export of energy and especially by its progress in the export of primary products and services (Graphs 12 and 13). It is well known that India excels in information technology, but it is also strong in various consultancy and advisory sectors, from call centres to medical treatment to educational support. Brazil, on the other hand, has very little to show in the way of services, and its manufacturing sector has declined. This might relate to the fact that Brazil has in recent years undergone a deindustrialisation phase, not least because of fierce competition from China. The weaknesses of Italy and Spain can be located in the loss of market share in primary goods. In this regard, competition from Brazil is clearly hurting them in global presence terms. Also significant is their stagnant performances in manufacturing (although here Italy retains a higher level than Spain, explaining its greater economic presence overall) and in services (where Spain, though stronger than Italy, has just been overtaken by India). Finally, in terms of investments, Spain has reached a plateau, while Italy is about to be overtaken by China – which only 10 years ago was relatively absent from this field, behind even Brazil. Overall, Italy and Spain are performing worse than France, which is losing some ground in all sectors (except investments), but very gradually. In any case, all three Mediterranean countries –France, Italy and Spain– need to introduce a number of reforms (for example, reindustrialisation and more investments in value-added services) if they want to retain their fair share of global economic presence. It is logical that big countries such as China, India or even Brazil should someday overtake the European countries, but this does not justify the stagnation that France, Italy and Spain have experienced in certain fields. Both the UK and Germany have proved that Europe can continue to be highly competitive and productive, and thus retain a good deal of market share in manufacturing, primary goods, services and investments. Nonetheless, even if the EB5 countries were to enhance productivity, increase their dynamism, and accelerate their growth rates, the structural trend shows that global economic presence is gradually moving eastward.9 India and China have closed the gap over the past 25 years, and it is very likely that they will continue to do so. This, of course, means that if the EB5 countries want to continue to shape the norms and rules in the field of global economic governance, they will have to coordinate their positions much more and act in unison within the EU structures. In this regard, it is worrying to hear an ever-greater number of voices from the best performing countries (the UK and Germany, but also France), calling for a renationalisation of their economies; in the UK there is even talk of leaving the EU (the so-called Brexit). Although these three countries still have a lot of global economic presence, and global presence overall (including military and soft), they will become mid-sized economies unable to compete with the US, China or India unless they join efforts. If they do not, their global economic footprint will only diminish faster. 1. See Kishore Mahbubani (2008), The New Asian Hemisphere: The Irresistible Power Shift to the East, Public Affairs, New York; and Danny Quah (2011), ‘The Global Economy’s Shifting Centre of Gravity’, Global Policy, vol. 2, nr 3, p. 3-9. For a review of the literature see Michael Cox (2012), ‘Power Shifts, Economic Change and the Decline of the West’, International Relations, vol. 26, nr 4, p. 369-388. 2. Andrew Moravcsik (2013), ‘Why Europe is the other Superpower in the 21st Century (and China is Not)’, paper presented at Johns Hopkins School of Advanced International Studies, Baltimore, 6/IX/2013. 3. Both concepts, the BRIC and the N11, were coined by Jim O’Neill, the chief economist at Goldman Sachs, in 2001 and 2005, respectively. 4. Hans Kundnani & Jonas Parello-Plesner (2012), ‘China and Germany: Why the Emerging Special Relationship Matters for Europe’, Policy Brief ECFR 55, ECFR, May. 5. Oh-Seok Hyun (2012), ‘South Korea miracle sets shining example’, The National, 14/VI/2012. 6. Despite the fact that the UK has surpassed Germany in global presence, as shown in Iliana Olivié & Manuel Gracia (2015), Elcano Global Presence Index 2015, Elcano Royal Institute. 7. This concept was first used by Martin Wolf (2010), ‘China and Germany unite to impose global deflation’, Financial Times, 16/III/2010. 8. Hans Kundnani (2015), The Paradox of German Power, Oxford, Oxford University Press. 9. 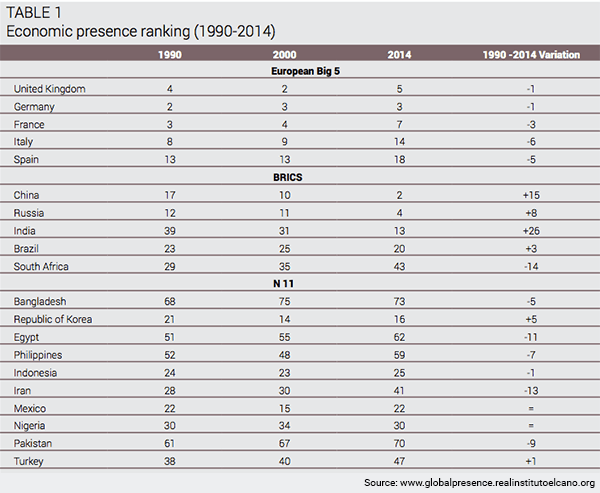 As pointed out in Iliana Olivié & Manuel Gracia (2013), Elcano Global Presence Index 2012, Elcano Royal Institute. Excellent article that analyses what we hear, see and read every day.